Stephanie and her husband, Mike, became members of the Down Syndrome Association of Minnesota in January 2013 after their son Carson was born with Down syndrome. It was through an e-newsletter Stephanie heard about the St. Paul Step Up For Down Syndrome Walk. “We knew it was something we would like to participate in as a way to give back to an awesome organization,” says Stephanie. It was shortly thereafter Team Carson’s Crew was formed. Carson, now 3, is a fighter. Stephanie shares, “When he sets his mind to something, he will accomplish it. He truly is one of a kind and we are thankful every day we were chosen to be his parents. Being around others brings him the most joy. When you see him smiling, you can’t help but smile back. His laughter is contagious and he can turn a whole day around with a hug.” Carson loves all animals, especially cats. He enjoys reading books, playing outside with his friends and sister, Nora, and snuggling with mom and dad. September will be the 4th year Team Carson’s Crew participates in the Step Up Walk event. 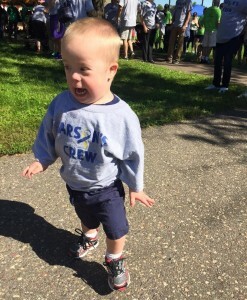 Supporting DSAM through the St. Paul Step Up for Down Syndrome walk has special meaning for Carson’s Crew. “They allowed us the opportunity to become part of an awesome community through their programs, specifically our local Down syndrome support group, which meets monthly and allows parents a safe space to voice concerns and share successes,” says Stephanie. The walk is an opportunity for Carson’s family to celebrate individuals with Down syndrome and pay it forward to other families who are walking the same journey. Each year, Carson’s Crew invites family and friends to join their walk team and encourages them to invite their networks as well. In addition to creating a team page on the walk registration site, Stephanie also creates an event on Facebook to help spread the word even further and keep track of friends and family interested in attending. Last year, the team also held a unique “Beer Bust” fundraiser, where they invited local friends and family to support their efforts. “My husband’s family owns two Beef O’ Bradys locations and they regularly hold Beer Busts throughout the year to fundraise for various charities and events,” says Stephanie. For the Beer Bust fundraiser, Team Carson’s Crew charged participants $10 for a glass cup. After purchasing the glass, participants were able to drink unlimited beer for 3 hours. The restaurant provided two kegs for free and the team was able to purchase additional kegs if needed. Additionally, Stephanie also organized a raffle at the beer bust with donated items. The team added $700 to their team total from the fundraiser. Wow!